Watercoloring. I've seen so many people using this technique, I decided to try it myself. Didn't turn out too bad for my first attempt. The colors I used were Crushed Curry, Tempting Turquoise and Pacific Point. The colors were so bold they really stand out and makes me want to be at a beach again. Or even better, the ocean. What I did for the watercolor was actually pretty easy. Fill an aquapainter with water. Squeeze to moisten the tip then brush on a piece of paper towel to get off the excess water. On an unopened ink pad, squeeze the middle together so the ink will get on the lid. Brush the tip of the brush on the ink and color on the watercolor paper. If you need more water, squeeze gently. The more water applied, the lighter the ink will be. On this card, I didn't re-water my brush at all. Always start with the lightest color first. In between colors, just squeeze the brush so the water will clean the brush. Wipe off and start with the next color. Tempting Turquoise is such a pretty color, but not one I use too often. I like to challenge myself sometimes and try something new. For me it was doing a new technique and using different color. Sometimes a challenge will be how to use a scrap piece of paper. I hate throwing away scraps. Designing a card around a scrap piece definately takes me out of my comfort zone. We all need that sometimes. I think that my club people would love to try this. Hmm. Another challenge. Design another card for them to use this fun technique. Click on the picture for the dimensions and instructions. I know it's hard to think about Christmas in August. But, it will be here before we are ready. This stamp set and framelit is in the new occasions catalog. The best news is that anyone can order this set now! Not just demonstrators, but you can too. I pre-ordered mine and UPS should be delivering it tomorrow! Yay! I can't wait to get my hands on this. I especially want to try the card with the vellum overlay. We did are family vacation in Key West this summer and I'm hoping one of our family pictures will look this good. Click on my "Shop Now" and look at all the goodies that come with this stamp set. Doesn't the weekend always go way too fast? Personally I think we should have 3 day weekends and 4 day work week. Doesn't that sound good? 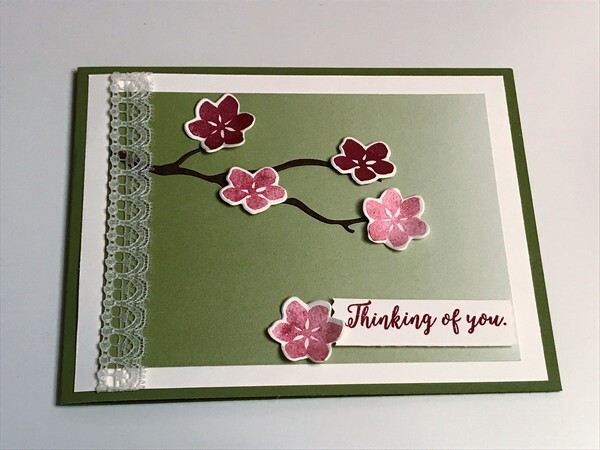 Here's a card using the Colorful Seasons stamp set. Did you notice my flowers look like they are two different inks? No they are not! They are both Berry Burst. 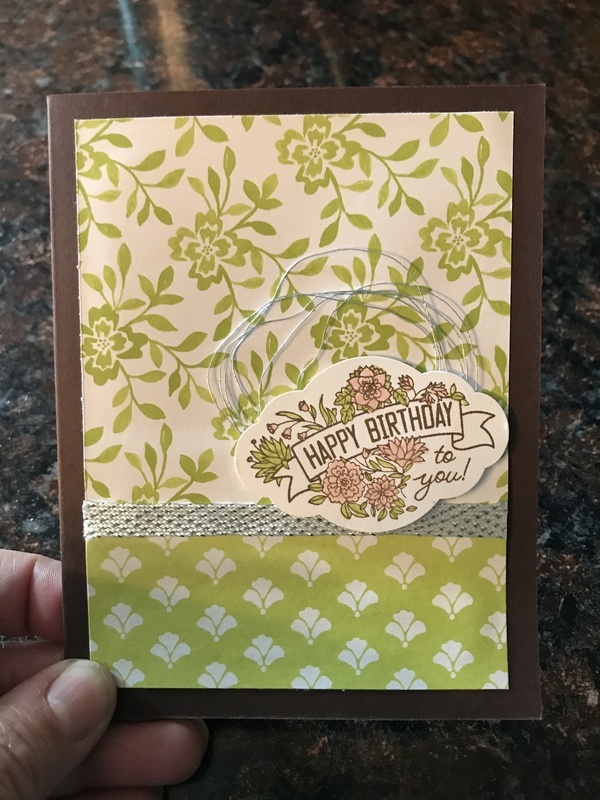 I used the technique called Stamping Off. You stamp the first image and right away stamp another image. Do not reink the stamp inbetween. This way you just get a lighter shade. I love this technique is because it's super easy. You don't have to worry about color coordinating. Here's a tip. Stamp a few extra flowers additionally to what you think you will need. Sometimes the cut image isn't always lined up in the framelit the way you thought. This way, you can just cut some of the extras you have ready. No going back to re-stamp! But don't throw away those extras! I like to keep mine with the stamp set. This way I always know where they are. Click on the picture for dimensions and directions. Oh so glad it's Friday! And I don't have to work this weekend! Yay! I haven't been in my craft room in a while so I'm hoping to make time to get in there. Probably not until Sunday. Here is another card using the Lable Me Pretty stamp set. Again, it's such a versatile stamp set. I love those sets that can be used for more than one occassion. Makes me feel like I'm getting more for my money! The Powder Pink and Lemon Lime Twist together make a great feminine touch. The Chocolate Chip card base makes them really stand out. Do you have any crafting plans this weekend? Click on the picture for dimensions and instructions. I tend to gravitate to the clean and simple card style, maybe because my house is never clean enough. The base is Tranquil Tide. 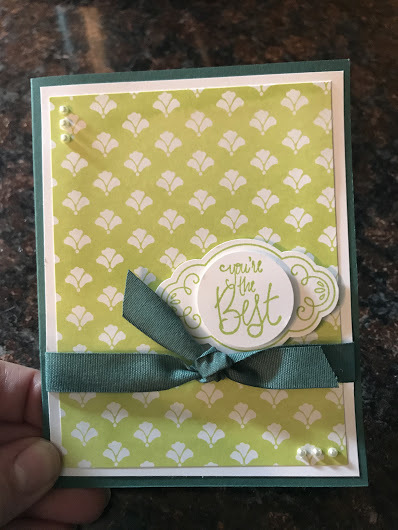 The patterned paper is the Lemon Lime Twist from Fresh Florals DSP Stack. Love those two colors together! These patterns together feel like a lemonade stand in the summer! The stamp set is Label Me Pretty and it comes with a punch! Punches are the best since they are super easy to use. The ribbon is in Tranquil Tide, of course. Gotta match that with the rest of the card! The sentiment I used is great because it can be used for so many occasions like Birthday, Thank You, Thinking of You, and Just Because. Just to name a few. I can't wait to play more with this set. 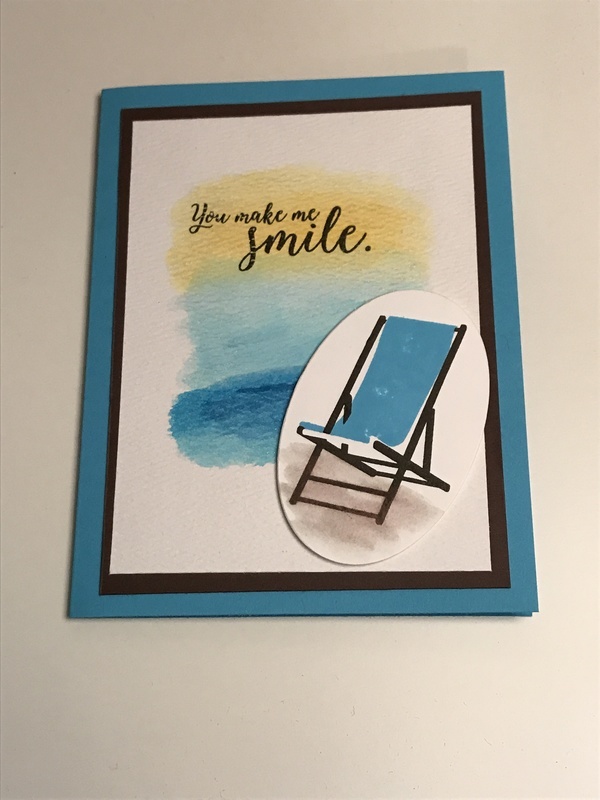 Click on the card for more details and dimensions! Welcome to my new blog! This is an exciting but yet scary adventure for me. I've never done anything like this at all. It doesn't help that I'm not a computer savvy person and I have so much to learn. I became a Stampin'Up demonstrator almost 2 years ago but have been using Stampin'Up for over ten years. Currently I have a club that meets the 2nd Tuesday of the month. The ladies are great! We always have a great time. Over time I will be sharing some past projects we have done. I like to do a variety of different things to keep things interesting. Sometimes we will do a 3-d project. Sometimes it just random cards. Sometimes I do a theme. Other times I will plan the club around a project so they could have a nice gift for someone. I do have a part-time retail job going on 17 years now. Never would I have thought I would be there this long. I am lucky to have a husband who didn't want me working full-time while our girls were growing up. He also insisted that we had home cooked meals. Eating out was not in our budget. I learned to cook at an early age from my mother. Therefore I have made sure my daughters know how to cook. Once a week I will share a recipe or tip for you to try. Sometimes the hardest part of planning meals is trying to come up with an idea of what to make. I'm just a small-town girl, living in Wisconsin, on a new adventure. This adventure was started when my daughters went away to college, leaving my husband and myself empty-nesters. I've been married over 20 years to my devoted hubby and we have two grown girls, Alyssa and Megan. I started scrapbooking when I realized I wanted to preserve the memories my family and I were creating. Eventually I turned to Stampin'Up which let me to my current chapter in life. I started stamping with Stampin'Up over ten years ago and in 2015 decided to take the plunge and become a demonstrator. Welcome to my crazy adventure! Unless otherwise indicated, all stamped images are © 1990 - current Stampin’ Up!®. The projects shown are for your personal inspiration and may not be copied for publication or contest submission. The content of this website is not endorsed by Stampin' Up!